Here comes Santa Claus, right down… well, a main street near you! With more than a dozen Santa Claus parades happening in the GTA this year, Jolly Old Saint Nick and his reindeer will be pretty busy from mid-November through Christmas Day. Here are all the Santa Claus parades this year in Toronto and the Greater Toronto Area regions of Durham, Halton, Peel, and York. All parades happen rain or shine (or snow), so dress accordingly and bring a warm beverage. Toronto’s Santa Claus Parade was first held in 1913, making it more than 100 years old! It’s still North America’s largest children’s parade, and while you won’t see Santa pulled by live reindeer like he was back in 1913, you will see floats, marching bands, and Santa in his (motorized) sleigh during the 2.5-hour extravaganza. This parade is beyond popular—arriving several hours early is not unusual. Can’t make it? Watch the Santa Claus Parade on CTV the same day at 4:30 pm. Parade route from Christie Pits Park east along Bloor Street West, then south along University Avenue to Wellington Street West, before making its way to Yonge Street, and ending at the St. Lawrence Market. The 28th annual Santa Parade in Lakeshore Village, Etobicoke, is a community-run parade with 15 floats (including a self-propelled train) and hundreds of coordinating costumed participants each year. It is one of the province’s largest Christmas parades, with more than 50,000 spectators in recent years. After the parade, stick around for Skate with Santa from 12 pm to 4 pm, where you can meet and take pictures with Santa and skate with his elves on the Colonel Samuel Smith Skating Trail. Route is along Lakeshore Boulevard West, from Dwight Avenue West to 37th Street. More than 10,000 people attend this annual Santa parade in Weston Village, now in its 40th year. More than 50 groups participate in the parade: past years have seen community floats, clowns, costumed dogs, dancing elves, and more. Bring non-perishable food items to donate to the Weston Area Emergency Support Food Bank. Begins at 2 pm. Route is along Weston Road, from Church Street south to Sidney Belsey Crescent. The 12th annual community parade in the Upper Beach neighbourhood is officially Hamper’s Santa Claus Parade, named for Community Centre 55’s mascot, Hamper the reindeer. Expect marching bands, floats, and costumed characters. Letters to Santa will be collected for delivery. After the parade there will be a barbecue, kids’ crafts, and photos with Santa at Community Centre 55. Route is along Kingston Road, from Victoria Park Avenue to Walter Street. At the 2nd annual Santa Claus parade in north Etobicoke, join Santa and his friends for an event with decorated floats, community organizations, fire trucks, costumed kids’ characters, and Santa on his sleigh. Route is along Albion Road, between Islington Avenue and Kipling Avenue. This annual nighttime Santa parade in Brock Township showcases illuminated floats and costumed groups. This year’s theme is Christmas Lights. After the parade, visit with Santa and enjoy hot chocolate at the fire hall at 360 Bay Street. Route is from the Beaverton Curling Club (164 Main Street) along Main Street to Simcoe to Osborne and around to Bay Street. The annual parade in downtown Bowmanville showcases floats, school groups, dance troupes, and costumed characters, including elves and, of course, Santa. Route is along King Street West from Scugog Street to Simpson Avenue near the Bowmanville Mall. Now in its 58th year, this parade in downtown Uxbridge includes costumed kids’ characters, floats, colour guards, horses, marching bands, and Santa and Mrs. Claus. Route is east along Brock Street from Centre Road to Uxbridge Secondary School. This nighttime parade features bands, floats, and Santa Claus and his sleigh, led by Rudolph. Route is along King Street West from Stevenson Road then north on Simcoe Street and doubling back along Bond Street West to Stevenson Road. An evening parade that kicks off with a fireworks display and continues with 70 entries in the parade, including marching bands, illuminated floats, and clowns. This year’s theme is Starry Night. Parade route along King Avenue, from North Street east to Arthur Street/Brookhouse Drive. For 50 years, floats, performance groups, and costumed participants have been parading down Glenanna Road for the annual Santa Claus Parade hosted by the Kinsmen & Kinette Club of Pickering. This year’s theme is A Golden Bells Christmas. Route is along Glenanna Road, from Dixie Road to Pickering Parkway. Ajax’s annual nighttime Santa Claus parade is followed at 7:30 pm by a tree lighting ceremony at Ajax’s Town Hall and an after-party at Ajax Main Library, with live entertainment, hot chocolate, and kids’ activities. Parade route from Bayly Street and Mackenzie Avenue, east along Bayly and then north on Harwood Avenue South to Ajax Town Hall. Rise and shine to see Santa Claus in Whitby, along with marching bands, dance groups, clowns, live music, and floats. More than 20,000 spectators come out to watch the parade each year. This year’s theme is Santa’s Elves. Route is along Brock Street, from Manning Road south to Trent Street. This year’s theme for the parade is A Homemade Christmas. The evening parade, hosted by the Scugog Chamber of Commerce and the Port Perry Lions Club, features illuminated floats, school groups, and costumed characters. Parade route is from Port Perry Fairgrounds (15835 Old Simcoe Rd.) and east on Reach Street, then south on Simcoe Street and east on Queen Street to Palmer Park. The sixth annual Santa Parade in Courtice, in Clarington is a volunteer-run 1.2-km parade with floats, marching bands, and Santa. This year’s parade theme is Holly Jolly Christmas. Bring non-perishable food for donation, and letters for Santa. Route is along Nash Road from Townline Road to George Reynolds Drive. This annual parade features more than 50 entrants, including floats, marching bands, and kid-friendly Christmas characters, including Santa! This year’s theme is a special one, as the parade celebrates 70 years. Bring toys to contribute to the annual toy drive. Route is west on Lakeshore Road from Reynolds Street, then north on Kerr Street and west on Stewart Street. This Christmas parade has been a Milton tradition since 1933—and as early as 1925, Santa rode along Main Street on the radiator of a car. This year, look for floats that complement the parade theme “The Next Generation.” And don’t forget those letters to Santa! Route along Main Street, from Scott Boulevard east to the Milton GO Station. Santa Claus is coming to Burlington, riding into town on his sleigh, along with floats, mascots, and bands. Bring non-perishable food items for donation and your letters to Santa for delivery. Route is along Guelph Line from Prospect Street near Burlington Mall then west on New Street, north on Brant Street to Caroline Street. This evening parade draws more than 150,000 spectators each year, making it the largest single-day event in the Peel Region. Bring your letters to Santa for Brampton Guardian letter carriers to pick up before Santa makes his appearance. Route from Sproule Drive and Ken Whillans Drive continuing on Main Street past City Hall and Gage Park to Elgin Drive. Come to downtown Bolton to see more than 50 floats, bands, and groups in Bolton’s annual Christmas parade, organized by the Bolton Kinsmen. This year’s parade theme is What Christmas Means to Me. The main attraction is Santa’s float, elaborately decorated with a miniature village, reindeer, and sleigh. Route along Highway 50, from Queensgate Boulevarde north to Centennial Drive. Now in its second year, the Mississauga Santa Claus Parade will be over 1 km and will welcome 15 custom floats, marching bands, costumed characters, jugglers, and themed groups. Kids should bring their letters to Santa for on-site Mississauga News carriers to deliver. Route is along Motorway Boulevard from Glen Erin Drive south to Woodchester Drive. The Streetsville Santa Claus Parade is back! While awaiting Santa’s arrival, parade-goers can enjoy music from several marching bands, along with mascots, dancers, and floats. Route is along Queen Street from Ontario Street south to Church Street. One of the season’s first Santa parades in the GTA is taking place in East Gwillimbury, with floats, music, and a free family skate and visit with Santa after the parade. Bring your letters to Santa and non-perishable food items to donate. Route is along Mount Albert Road from the civic centre to the East Gwillimbury Sports Complex (1914B Mt. Albert Rd.). Vaughan gets into the holiday spirit with its annual SantaFest and Santa Claus Parade one month from Christmas Day. Entertainment starts an hour before the parade begins. Live music, kids’ crafts, and a parade with colourful floats, marching bands, and colour guards. Arcadia Academy of Music and Toys “R” Us will have pre-parade fun for kids at the corner of Melville Avenue. Route is along Major Mackenzie Drive from Canada’s Wonderland to Vaughan City Hall (Keele Street). More than 50 floats, dance groups, costumed walking groups, and bands are all part of the annual Christmas parade in Newmarket. Bring your letter to Santa for delivery to the North Pole and non-perishable food for donation to the Newmarket Food Pantry. Route is from Eagle Street at Lorne Avenue, east to Main Street and north to Ontario Street. The Town of Georgina’s annual Christmas parade features floats, marching bands, sports associations, school groups, and, of course, Santa! Route is along the Queensway from Biscayne Boulevard to Metro Road, then north on Simcoe Street to Church Street and east to the Queensway. This nighttime Santa parade has been an annual tradition in Richmond Hill since 1974. This year’s theme is Rockin’ Around the Christmas Tree. At the parade, expect themed floats, school bands, and Santa on his sleigh. Don’t forget to bring your letter to Santa—Canada Post employees will be collecting them during the parade for delivery to the North Pole. Route is from Elgin Mills Road and William F. Bell Parkway south along Leslie Street to Performance Drive. Main Street Markham welcomes floats, marching bands, musical entertainment, and Santa Claus for its annual holiday parade, now in its 46th year. This year’s theme is Peace on Earth. Route is from Highway 7 and Markham Road along Main Street Markham to Bur Oak Avenue. In Aurora, the annual nighttime Christmas parade is one of Ontario’s largest. The festive procession of decorated and illuminated floats, marching bands, and special guests attracts more than 40,000 spectators annually. Bring your letters to Santa, along with non-perishable food for donation. Route is along Yonge Street, from Orchard Heights Boulevard to Murray Drive. This year marks the first evening Santa Claus Parade in Stouffville! Planned for the parade this year are floats, entertainers, music, and plenty of twinkling lights. Head to Memorial Park right after the parade for a Merry and Bright celebration that includes live music, warm treats, and a fireworks display. Route is eastbound along Main Street, from just west of Ninth Line to Park Drive South. The village of Schomberg in King Township hosts a Christmas festival like no other in the GTA, with not one, but two parades! 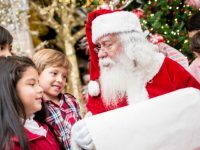 Afternoon and evening festivities include a craft show and food vendors serving seasonal goodies and, at 4 pm, the Santa Claus Parade, with creative floats, costumed groups, and music. The Spectacular Farmers’ Parade of Lights begins at 8 pm, with farm machinery decorated with Christmas lights and Santa aboard a giant combine harvester. Route is from the Schomberg Comm & Agri Arena (251 Western Ave.) to Main Street and south to Church Street.